In this blog post I will take a look to the quantitative data from my fieldwork, discussing some findings from a questionnaire I conducted with students in their final two years of secondary school in Grano. 539 students participated, mostly aged between 17-19 years old. More than 90% of respondents were actively using Facebook and 80% WhatsApp. These impressive numbers reflect that in Grano the two services were seen as two complementary facets of sociality: the former being extremely public and the latter more private and personal. In contrast, most young people did not have a clear idea about what to use Instagram and Twitter for: relatively more students used Twitter primarily to be in contact with friends than to follow celebrities (45 vs. 30%) and many used it to talk to their colleagues, family members, and partners (22%). While Instagram was more clearly used to establish relationships based on shared interests, still many used it primarily to stay in contact with school colleagues (18%) and friends from their hometown (14%). For example, those who were commuting to study in Grano used Instagram to share images from their hometown with school friends and share image from school and Grano with friends from their hometown. Most of the parents and older relatives did not even bother to ask their children what they did on Twitter or Instagram, even less to actually try and log in to these platforms. 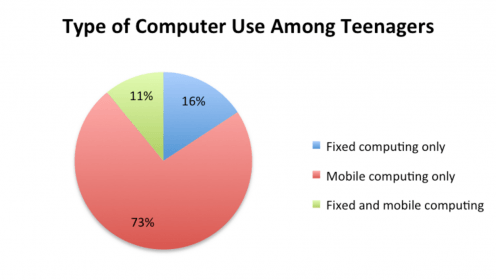 86% of students owned a smartphone and 99% owned or shared at least one computer with their family: 83% owned some sort of mobile computer as opposed to only 16% who owned only a desktop. These figures correspond to a recent OECD report that shows that 65% of Italian families with at least one child have a computer at home, while on average there are just six PCs for every 100 students in Italian schools. In my forthcoming book, I explain how these figures reflect the particular importance of home education in Grano. 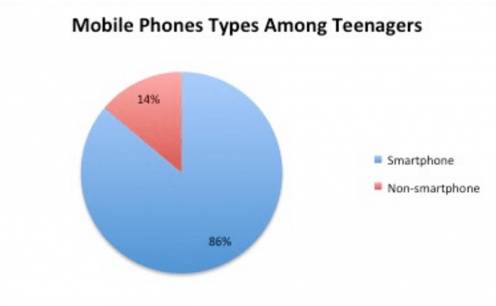 Most children receive their first smartphone at 10-12 years old and parents try to resist decreasing this age further. 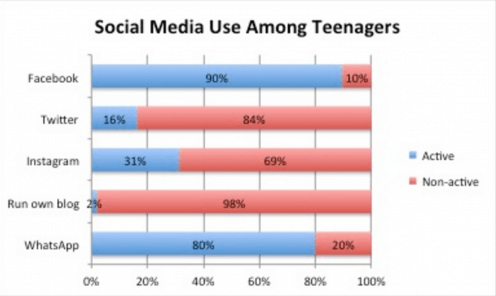 This is the age when many children also start to use social media, including more controversial platforms such as ask.fm. Throughout their adolescence their mobile use and online presence is constantly diversified as their universe continuously expands: many participate in secondary education away from their hometowns, start romantic relationships, and gain increased autonomy from their families. In a separate questionnaire on the use of social media, 82% of respondents felt that that children should only start using social media after the age of 14 years old, the main reason being that younger children are not considered to be adequately mature to establish relationships in such a public environment. In contrast, my ethnographic qualitative data suggests that despite the relative unease of parents and teachers regarding their children’s use of mobile phones and social media, they actually encourage this use as many see it as compulsory for assuring young people a good future. This is a good example of how quantitative data was balanced by ethnographic insights in the Why We Post project. Note: Thanks to Shriram Venkatraman for helping with statistics and graphs.